T-Does was two weeks ago but I was so busy since then that I have not managed to write down my experience yet. I better do it now before I totally forget the details. I flew to Amsterdam on 4th November and used the few hours left of that day to walk around the city. I was in Amsterdam three years ago for 12 hours when I had a really bad connection from the US back to Israel. That time I was so tired that the only thing I could do is looking for a bench in a park to try to sleep a bit. This time I put my luggage in a locker and had a little walk. Later I took the train to 's-Hertogenbosch where Martin Berends already waited for me. We planned to hack a bit but spent the next day talking and walking around the city. When on Saturday we arrived to the Fontys University of Applied Science in Eindhoven there were some people already around setting up their stands. The place is not large, there were about 20 stands in 4 rows. Opposite the entrance, separately, there was an OTRS booth. In the middle aisle there was a WebGUI table. The Perl group got two large table slightly behind the door but strategically placed next to the source of the food and drinks. You could not miss it unless you were on a very strict diet. So there were actually 3 Perl related stands. That's great. We found the materials sent over by Renee Baecker on our table and started to unpack. Tuits, beer-mats, flyers. The usual stuff. A few minutes after we arrived, Liz and Wendy also came in and they brought their camel along. 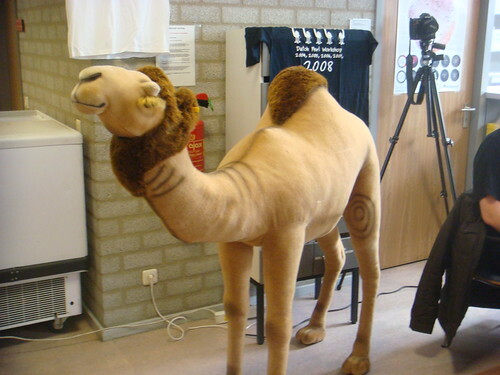 Meeltje is a very lovely camel. Not only that, they also brought their whole Perl library along with two shelves. I think they have almost every Perl book ever published. And not only in English. They also brought a couple of the nice maps of Github, and CPAN etc. We hanged them posters on the wall around the tables. During the two days of T-Dose I managed to go to a number of talks and even experienced a bit with the Arduino. It comes with an IDE but it is horrible. If I have some tuits I'll try to integrate their command line tool with Padre and then we'll see if they want to switch. People who visited the conference came by the booth and the NL.pm members were busy talking to them. In general I don't think they needed me there. There were enough NL.pm members to talk to all the visitors and they speak better Dutch than I do. 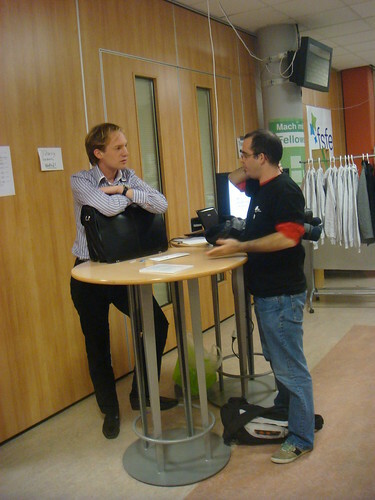 Nevertheless I managed to use my time and talked to a number of people about the Perl Ecosystem Group. Not only that but I managed to sign up two companies to become members. One of them is Dijkmat BV managed by Elizabeth Mattijsen en Wendy G.A. van Dijk. The other one is Oqapi which is the leading WebGUI provider in The Netherlands. On Monday I went back to Amsterdam, had a meeting there and an evening flight back to Israel. These aren't good flights. Arriving at 4 am without much sleep. I was totally useless the next day. Anyway, I think it was worth spending my time on this trip. I enjoyed myself very much with Martin and meeting the other Perl people. I had a few good chats with potential members of PEG and 2 already signed up. Still the thing that made me very happy was that many of the NL.pm people who were at the booth thought it was cool to be there. They already talked about going to other events as well and coming to T-Dose next year again. 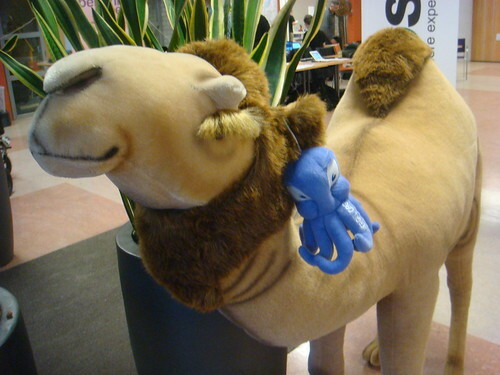 I think if the only thing I can achieve is to get the Perl Mongers all over the world to start going to non-Perl events and start talking to other people, that already would be a huge win. They also started to prepare a flyer for themselves and started to discuss on their mailing list how to present themselves. My next trip is to the London Perl Workshop.